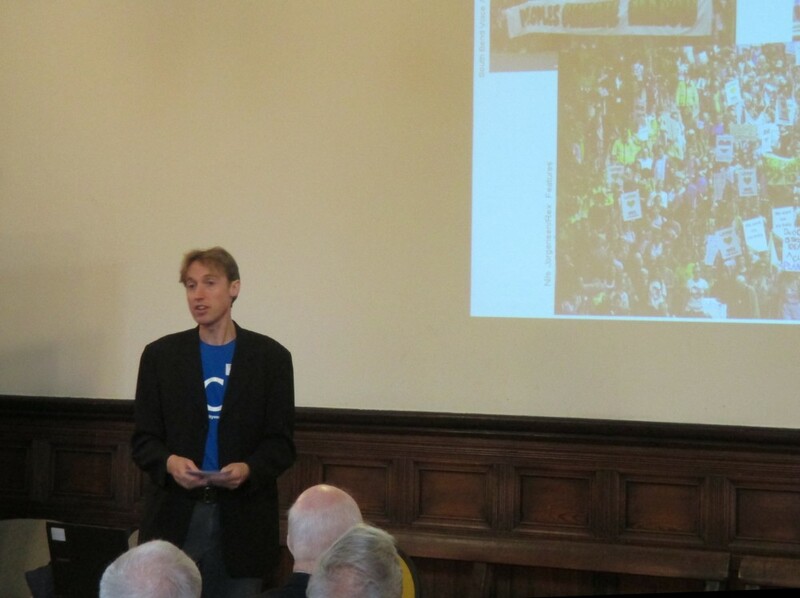 Our half-day conference “Powering the City” took place last weekend. We had over 60 people along and we’d like to thank everyone who attended and made the event so successful. Attendees and organisers tweeted throughout on the hashtag #YorkCE15. 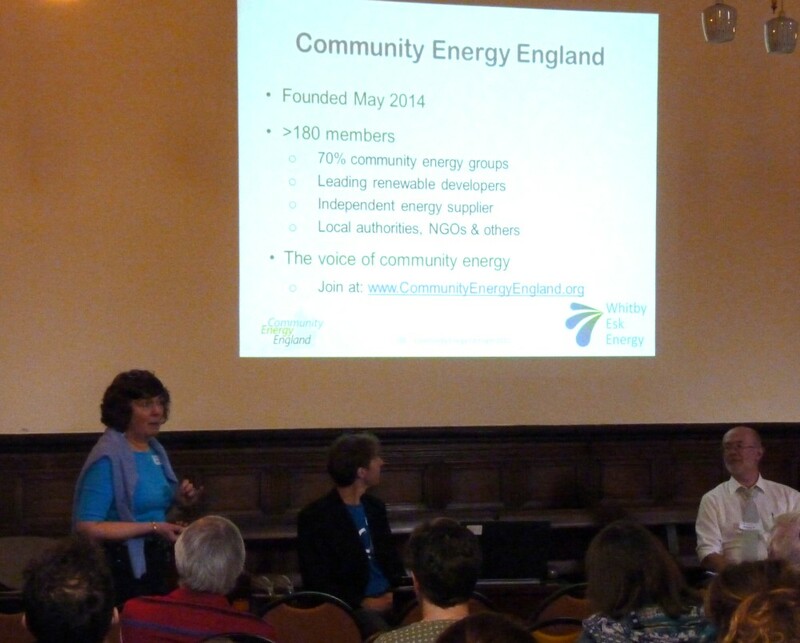 After a welcome introduction from YCE Chair, Richard Lane, our first presentation was from Debbie Trebilco, a director of Community Energy England and member of Whitby Esk Energy. She updated us with the latest developments in community energy, including the recent surprise cuts in the subsidy for clean power, which make things harder for community energy projects but do not mean the end of the road. The government is currently in the middle of a consultation and we urge all supporters of clean energy to sign the current petition to the DECC opposing the cuts. Debbie also talked us through how Whitby Esk Energy installed a 50kW Archimedes screw turbine on the river Esk. Frequently, when we express our own support for wind power, hydropower is often cited as something less controversial that we could do instead – it was interesting therefore to hear that it is far from uncontroversial! Next up was Finn Jensen of Pennine Community Power, who told us the story of how they had installed a wind turbine above Blackshaw Head, north of Hebden Bridge. The proposal had been widely supported – their share issue was oversubscribed purely from residents of the four or five neighbouring towns and villages. Though the local Parish Council were initially opposed, the district granted planning permission. They are now working on a plan to install solar panels onto local buildings. Richard Collins of Sheffield Renewables told us how they had spent long and ultimately fruitless years trying to develop hydropower schemes before having more success with solar installations on community buildings – the footsteps in which we are hoping to follow. They are now looking to fit their third solar array, having generated almost 100,000kWh of clean energy from their first two (see their graphs here). 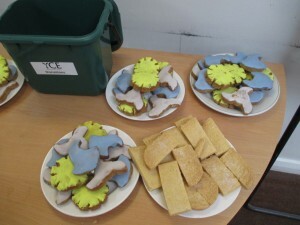 After a Q&A session and a break (complete with renewable-themed biscuits), we heard from Jacqui Warren, City of York Council’s sustainability officer. She talked us through the results of the Council’s studies into the potential for renewable energy generation in York. We also heard how York compared with the national picture in terms of our energy consumption. Our final speaker was Pete Kilbane of the Golden Ball community pub. He told us how local residents took the fate of their local pub into their own hands when they formed a co-operative and took over the lease, becoming the first ever city-centre co-operative pub. As well as safeguarding the very traditional style and layout of the pub (it is a Grade 2 listed building), they can ensure they pay a living wage and have a continual stream of community events. 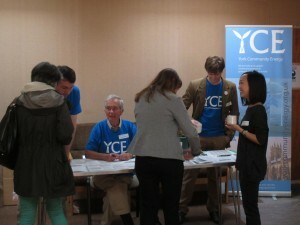 YCE members ran two parallel workshops. In Powering the Country we discussed the national and global situation of renewables and their place within the wider challenges of climate change. After a brief overview of the state of the science and technology we discussed the obstacles to decarbonising our electricity supply and how they could be overcome. 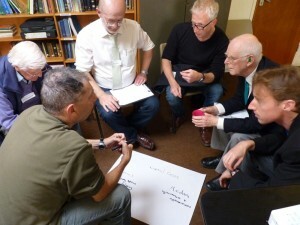 In Powering York we drew on the local knowledge of attendees, discussing possible projects in York. We are planning to investigate several of the proposals that came from this session, which was very valuable. So, that was a great outcome to a lot of hard work by the YCE team; but there’s a lot more coming up soon, with our study tour to Hockerton next on the horizon. If you’d like to help us develop any of these projects, please do get in touch! Again, we’d like to thank everyone who attended – especially all those who took the opportunity to join YCE or donate money. Your generous donations went most of the way to covering the cost of the event, which is more than we expected. You can see more photos from the event on our Flickr group. If you’re interested in a copy of the presentations, please get in touch.